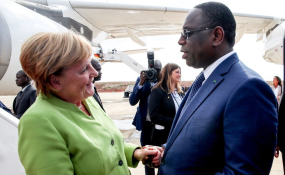 The Nigerian Ambassador to Germany, Yusuf Tuggar, says German Chancellor Angela Merkel's visit to Nigeria on Thursday will focus on enhancement of economic relations and security between the two countries. Mr Tuggar said at a news conference in Abuja on Wednesday that Ms Merkel would be coming with a business delegation to explore investment opportunities in Nigeria. "She is coming with a business delegation which is very important. We have strong economic relations with Germany over the years. "But one of the major challenges in recent times has been how to attract German medium-size businesses to invest in Nigeria. According to him, this sort of step requires cooperation and support by both governments to facilitate the investment and minimise risk. "This, of course, fits into Nigeria's Economic Recovery and Growth Plan and the Presidential Enabling Business Council. "On the German side, they know the importance of these medium-size companies and they try to support them and see that they take an increasing role in a globalised world. "At the moment, the German Government is also doing everything to push out their small and medium- scale businesses to take their place in an increasingly globalised world," he said. The ambassador said that some business persons on Ms Merkel's entourage would sign agreements with some Nigerian companies. "Nigeria wants to take advantage of the areas Germany has comparative advantage. "Some German companies are interested in Nigerian agriculture sector. This is about how to strengthen our agricultural sector to create prosperity for Nigerians, especially, for young people." Mr Tuggar further said that security, particularly in the Northeast, would feature in discussions between the leaders of the two countries. "We need support to address security issues, particularly in the North Eastern part of Nigeria. "As people are returning to their villages and towns and begin to normalise their means of livelihood, which is mostly farming and trading, there is a need for global support to rebuild communities. "After this visit, Oslo '2' will follow. This is about how to mobilise global support for rehabilitation process in the Nigerian Northeast." He said the Oslo '2' conference, aimed at raising funds to address the humanitarian crisis in the Northeast, would take place in Germany in September. Germany has been a very significant Nigeria's partner and "there is still a lot we can do with Germany," he said.